T FEBRUARY 2019 • FOODSERVICE EQUIPMENT & SUPPLIES • 67 hree-dimensional modeling applications continue to build momentum in commercial kitchen design. 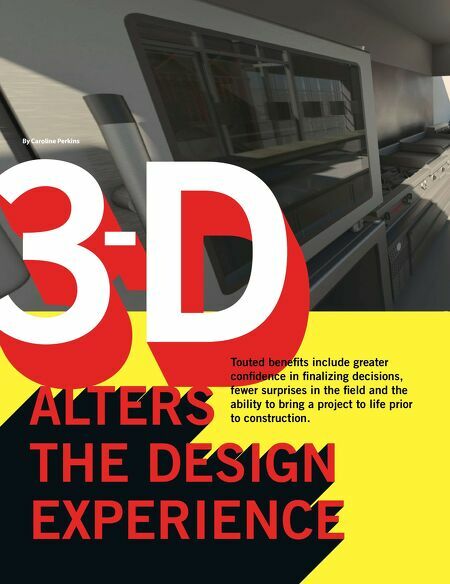 Because 3-D modeling adds width, height, depth and spatial relationships, commercial kitchen designers increas- ingly turn to this emerging technology instead of older-generation two-dimen- sional plans and manual formats that were the mainstay for years. Overall, 3-D modeling enables the operator to see a realistic view of the space, including how everything will look inside it, offering a preview of how a design may function before the final structure is built. 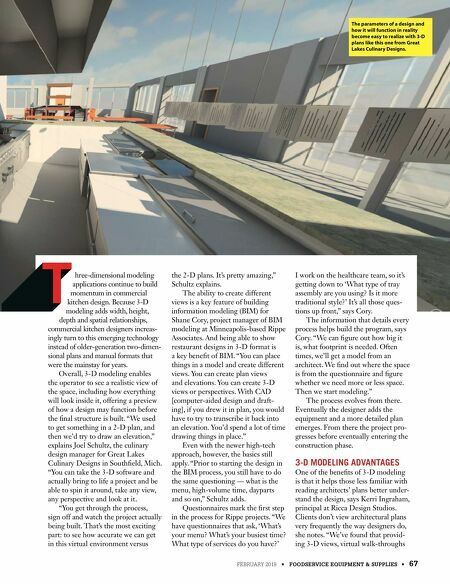 "We used to get something in a 2-D plan, and then we'd try to draw an elevation," explains Joel Schultz, the culinary design manager for Great Lakes Culinary Designs in Southfield, Mich. "You can take the 3-D software and actually bring to life a project and be able to spin it around, take any view, any perspective and look at it. "You get through the process, sign off and watch the project actually being built. That's the most exciting part: to see how accurate we can get in this virtual environment versus the 2-D plans. It's pretty amazing," Schultz explains. The ability to create different views is a key feature of building information modeling (BIM) for Shane Cory, project manager of BIM modeling at Minneapolis-based Rippe Associates. And being able to show restaurant designs in 3-D format is a key benefit of BIM. "You can place things in a model and create different views. You can create plan views and elevations. You can create 3-D views or perspectives. With CAD [computer-aided design and draft- ing], if you drew it in plan, you would have to try to transcribe it back into an elevation. You'd spend a lot of time drawing things in place." Even with the newer high-tech approach, however, the basics still apply. "Prior to starting the design in the BIM process, you still have to do the same questioning — what is the menu, high-volume time, dayparts and so on," Schultz adds. Questionnaires mark the first step in the process for Rippe projects. "We have questionnaires that ask, 'What's your menu? What's your busiest time? What type of services do you have?' I work on the healthcare team, so it's getting down to 'What type of tray assembly are you using? Is it more traditional style?' It's all those ques- tions up front," says Cory. The information that details every process helps build the program, says Cory. "We can figure out how big it is, what footprint is needed. Often times, we'll get a model from an architect. We find out where the space is from the questionnaire and figure whether we need more or less space. Then we start modeling." The process evolves from there. Eventually the designer adds the equipment and a more detailed plan emerges. From there the project pro- gresses before eventually entering the construction phase. 3-D MODELING ADVANTAGES One of the benefits of 3-D modeling is that it helps those less familiar with reading architects' plans better under- stand the design, says Kerri Ingraham, principal at Ricca Design Studios. Clients don't view architectural plans very frequently the way designers do, she notes. "We've found that provid- ing 3-D views, virtual walk-throughs T T T T T T T T T T T T T T T T T T T T T T T T T T T T T T T T T T T T T T T T T T T T T T T T T T T T T T T T T T T T T T T T T T T T T T T T T T T T T T T T T T T T T T T T T T T T T T T T T T T T T T T T T T T T T T T T T T T T T T T T T T T T T T T T T T T T T T T T T T T T T T T T T T T T T T T T T T T T T T T T T T T T T T T T T T T T T T T The parameters of a design and how it will function in reality become easy to realize with 3-D plans like this one from Great Lakes Culinary Designs.